1. Log block cutting molding, fine grinding, soft handle, intimate care. 2. The efficiency of shaping, allowing you to quickly have the perfect. 3. Imported high quality logs, high toughness, wear resistance, beautiful texture. 4. Professional ballet instep shaper, mainly focuses on the toes and legs and feet instep nest pressure, push and pull, the feet back, in the instep and feet back muscles and ligaments stretch function. 5. This is the original Ballet Foot Stretch. It is Unisex. 6. This demonstrated that not only allows flexible feet, also helps to strengthen the foot, knee and leg muscles. 7. You can enjoy the use of your foot stretcher more effectively, and with more comfort. 1.22cm above the feet of men and women. 2.Need to exercise the instep, ballet, Latin dance, belly dance, yoga and other dancers. 3.Need to make more perfect professional high instep ballet dancer. 4.I hope the instep more gentle towering straight lovers. 5.Applies to the use of classical ballet and other dance dancers. 1.Manual measuring, please allow 1 ~ 3 cm error. 2.Beginners each time in 20 minutes, 2~3 times a day more comfortable. 3.In the use of the instep shaper, must take the ankle and instep activities, avoid unnecessary injury. Ergonomic curve design, fine grinding, make you feel more comfortable. 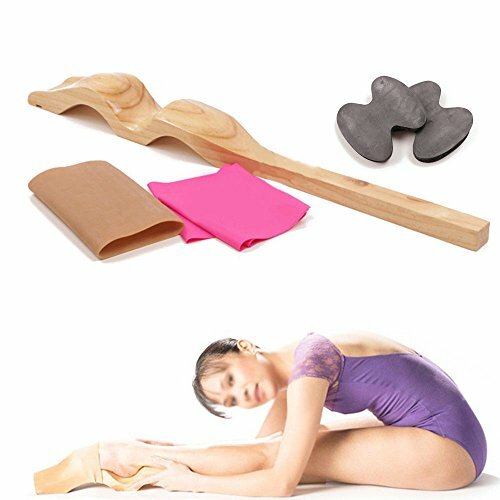 The ballet foot stretcher is A personal portable tool to improve the feet of DANCERS and GYMNASTS. stretch is a new concept for improving the aesthetics of the stretched foot. No metal joints, plastic, sharp screws nor springs. Made of high quality wood - The natural wood is a highly resistant raw material, meticulously carved and polished so that it is smooth and pleasant to the touch, specially thought for the delicate structure of the feet. Before using the foot plasticizer, be sure to open the ankle and instep, to avoid unnecessary strain.Before and after use can be used alone Rally with intensity training. If you have any questions about this product by GADE10, contact us by completing and submitting the form below. If you are looking for a specif part number, please include it with your message.